To keep Latino and low-income students on a path to graduating with degrees in science and engineering, UC Santa Cruz has been awarded a $5.7 million grant from the U.S. Department of Education’s program for Hispanic-Serving Institutions. The UC Santa Cruz Science Education & Mentorship In Latino Lives in Academia (SEMILLA) Project, based in the campus’s Division of Student Success, will enable the campus to create a comprehensive set of interventions—guided by analysis and research teams—to support students in clearing the barriers they face inside and outside the classroom. 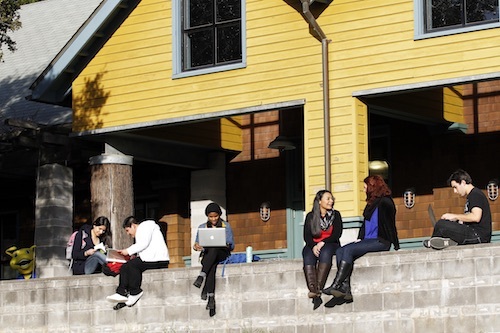 About 30 percent of UC Santa Cruz’s undergraduates are Latino, and about 40 percent of undergraduates are from low-income families. Majors in science, technology, engineering, and mathematics (STEM) are among the most popular for all UC Santa Cruz students, including Latino and low-income students. As students begin undergraduate coursework in mathematics, chemistry, biology and computer programming, achievement disparities emerge for Latino, underrepresented, and low-income students, said Reguerin. This often results in Latino and low-income students dropping their STEM major for a different field, an outcome that adversely impacts the U.S. economy, social mobility, and opportunities for students of color. The SEMILLA project is designed to break attrition patterns and social reproduction rooted in both the under-preparation of students and the under-preparation of UC Santa Cruz to serve Latino and low-income STEM students, Reguerin said. “If we can meet these challenges—interrupting STEM attrition patterns and building permanent institutional strength in this area—we will contribute to a better UC system and a better California, empowered by upward social mobility for all, and capable of defeating a two-track educational system based on patterns of class and racial social reproduction,” Professor Juan Poblete said. The grant was awarded to Reguerin, Poblete, and John Tamkun, professor of Molecular, Cell, and Developmental Biology. The group collaborated with a team of faculty and student support staff at UC Santa Cruz. Through the five-year grant, UC Santa Cruz will conduct an equity analysis; establish a STEM Learning Center; expand academic support programs including Learning Support Services, ACE Academic Excellence Program, the Engineering Summer Bridge program and Multicultural Engineering Program (MEP); offer faculty professional development; design a seminar-style College Math Academy; provide holistic STEM counseling; create new programming to foster a sense of belonging, and much more. The project aims to reduce by 20 percent the number of Latino and and low-income students who switch to a non-STEM major. Additionally, the campus will work toward a 10 percent increase in the number of Latino and low-income STEM students who graduate in six years or less. The project will also support transfer students. The campus hopes to boost the number of Latino and low-income STEM transfers by 20 percent and increase the three-year graduation rate by 20 percent. SEMILLA will partner with local community colleges, many of which have also received HSI awards from the federal government. Last year, UC Santa Cruz was awarded two grants from the U.S. Department of Education, totaling $3.6 million, to help the campus increase achievement for Latinos and all students on campus, as well as partner with San Jose City College to help transfer students earn their bachelor’s degrees at a research university.